Although the only way to truly support the title, “anti-aging,” is to embrace the inevitable part of life – death, there are things we can do to prolong our existence… and feel better and more youthful. There are many factors in our lives that affect our health and aging. However, simple changes in your lifestyle can provide that tail wind pushing you through more youthful years. Aging is the natural process of ‘wearing out’ over time. The cardiac output decreases, blood pressure increases and arteriosclerosis develops. The lungs show impaired gas exchange, a decrease in vital capacity, and slower expiratory flow rates. Progressive elevation of blood glucose occurs with age and osteoporosis is frequently seen due to a decline in bone mass after the fourth decade and our joints begin to wear out as well. Older people also lose muscle mass and flexibility. This decline of lean body mass is likely due to inactivity and a tendency to use less of the available range of motion during movement. Now that’s all the bad news about growing older. Here’s the good news: You can improve your strength and muscle mass as well as improve and flexibility with appropriate exercise. Even better, in conjunction to a healthy diet, it is shown that we can alter ALL the above physiological effects by significantly slowing down or even reversing these processes from daily exercise! Exercise Slows the Aging Process: Aging muscles have trouble regenerating and have fewer and less efficient mitochondria, the energy powerhouses of our cells. But exercise, especially when it’s high intensity, increases the number and health of mitochondria — essentially helping to reverse aging at the cellular level. It May Lengthen Your Lifespan: Exercise has been linked time and time again in studies both large and small to reductions in mortality from all causes. But some of the most fascinating research comes from extensive analyses carried out at the Cooper Institute in Dallas, which show that compared with non-runners, runners tend to live about three years longer. Every hour of running you do can add an estimated seven hours to your life expectancy. Studies have found that as little as five minutes of daily running is associated with longer lifespan. Exercise Improves Your Body Composition: Those who have a healthy body composition compared to people who are overweight or underweight live longer on average. Most people gain fat as they get older… It’s essentially inevitable. But lifting weights and following a good diet have the opposite effect: They help you put on muscle and lose fat, even if you are older than 60. Also, when being heavy-set, decreasing your weight to a healthy body composition decreases the load on your joints, such as your knees and hips. This can significantly reduce inflammation and slow down degenerative changes, particularly osteoarthritis. 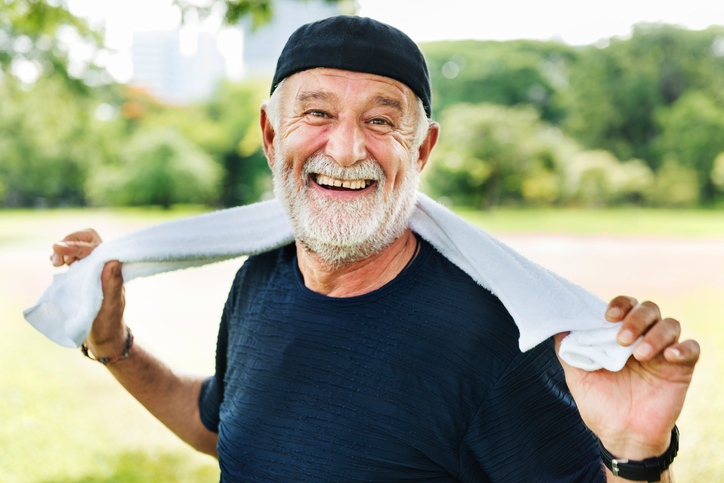 It Can Boost Your Brain Health: Studies of aerobic exercise have found that it protects your memory and helps stave off cognitive decline as we age. In fact, in the average adult human, the brain represents about 2% of the body weight. Remarkably, despite its relatively small size, the brain accounts for about 20% of the oxygen and, hence, calories consumed by the body. Therefore, aerobic exercise feeds the brain and keeps us slim! Decrease stress -> Increase positive mood -> Bring laughter -> Induce proper sleep habits -> Aide digestion -> Increase energy -> Stimulate productive, mindful decisions -> Generate success! Set a timer to remind you to get up every 20-30 min at work and walk to the water fountain or around the office. Go for a short stroll on your lunch break several days a week. A 2015 study in the Scandinavian Journal of Medicine and Science in Sports found that workers assigned to walk for 30 minutes several days a week during their lunch hours felt less tense and generally saw improvements in their overall moods. Take your dog for longer or more frequent walks. Get a standing desk at work if you are able to. It doesn’t mean you have to stand all day. You can get an adjustable desk that allows you to alternate between standing and sitting. Get a Fitbit or a pedometer and try to walk 10,000 steps each day. You’ll be amazed at how much it motivates you to move. Note: Starting an exercise routine can be intimidating and/or difficult. Find support with a workout buddy, a personal trainer, or try home fitness videos or apps. If pain is stopping you or you are afraid of re-injury, consult a physical therapist. Haff, G., & Triplett, N. T. (2016). Essentials of strength training and conditioning, Fourth Ed. Champaign, IL: Human Kinetics.